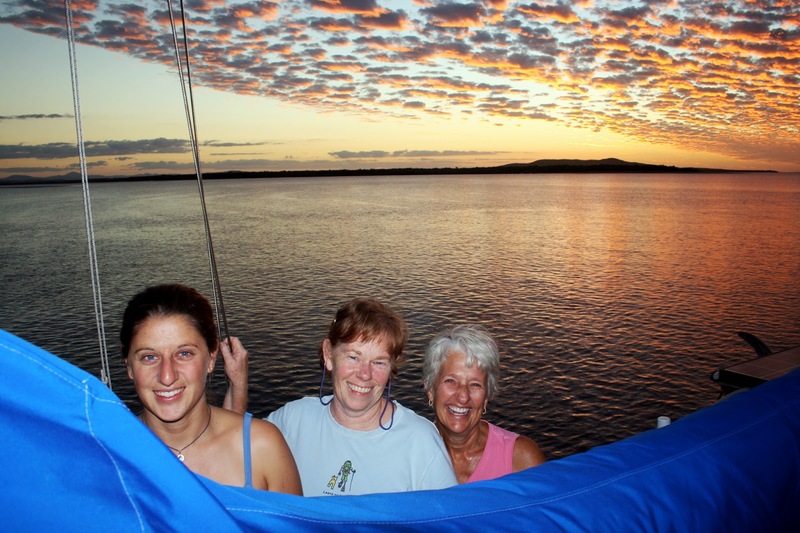 Originally, we had planned on hopping up the Queensland coast, spending our evenings tucked away in some pleasant anchorage, of which there are many. However, Mary's time aboard was growing short (that damned calendar!) so we decided to do an overnight passage to the Whitsundays. Besides, this gave Mary the experience of sleep deprivation, which is part and parcel of cruising on a sailboat when doing overnight passages. Mary didn't actually stand a watch but she did stay up through most of mine. The winds were non-existent so we were under power the entire way and we arrived under cloudy skies at Whitehaven Bay, famous for it's long beaches of fine white sand, in the early afternoon. 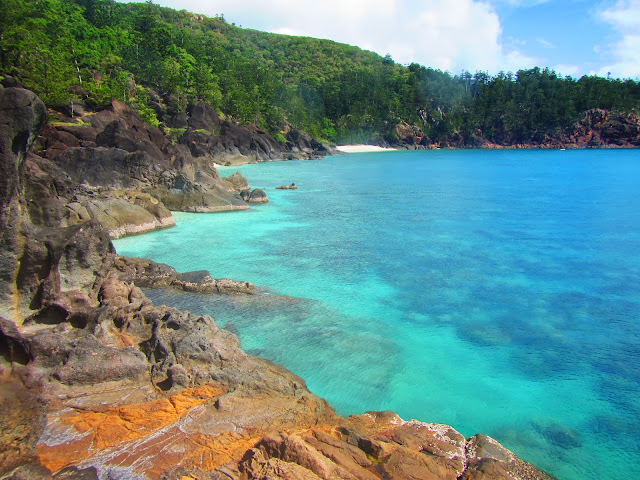 The Whitsundays are a very popular destination not just for people cruising on sailboats but it attracts visitors from all over the world. The waters are filled with the wakes of passing ferries and tour boats and even though things calm down at night, the heavy traffic deprives the area of remote-destination feel. We only spent one night at Whitehaven Bay and left early the next morning. 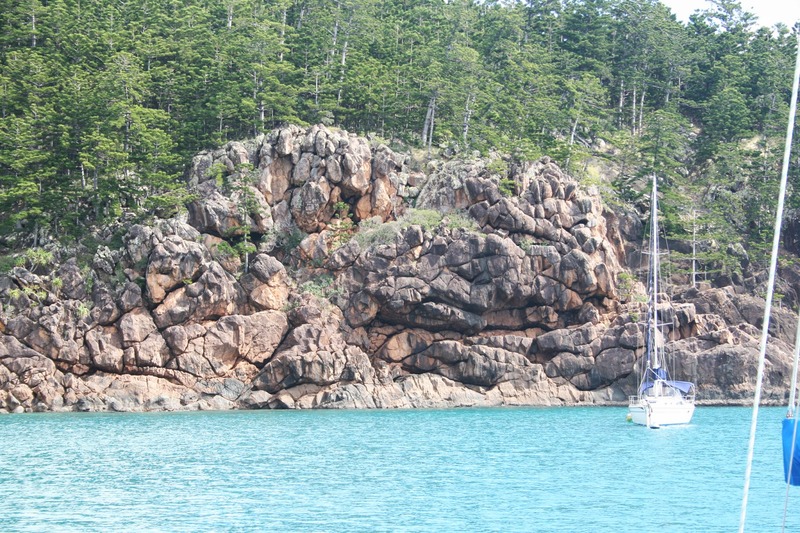 Hook Island is just north of Whitsunday Island and the most northerly part is Pinnacle Point. As we rounded the point we could see one boat hanging on a park-provided mooring. Ruthie looked closely with the binoculars and discovered a second mooring with no one on it. What a score! We felt it was like getting an up front parking spot in a crowded mall. The Marine Parks Department of Queensland establishes Reef Protection Zones and boats are prohibited from anchoring inside those well-marked areas. However, the Parks Department also installs a few moorings that are free to anyone although certain size limits apply but we raced to snag the one that was empty. Written on the mooring are rules for it's use, which include a 2-hour limit and we started looking around for the meter maid who would either kick us off or write us a ticket. 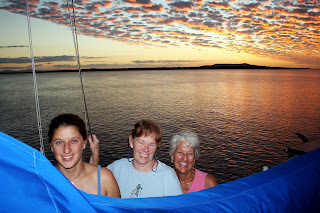 When the other boat in the little bay left, we relaxed and wound up spending the night. The bay was beautiful, calm, remote and for most of the time we were there, we had it all to ourselves. Regardless, we felt a little guilty for spending 24 hours on a mooring with a 2-hour limit so the next day we went to cast off for other destinations. We started our trusty diesel, just like so many times in the past and it ran fine - for about 30 seconds before sputtering and dieing. It took Ruthie and me over an hour to find the problem (a manual transfer pump on the final fuel filter froze) but by then we had taken almost the entire fuel delivery system apart and put it back together. We're now running the engine without a final fuel filter which would scare the hell out of most diesel mechanics. 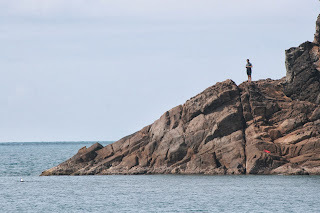 Once the engine was running again, we motored around to the west side of Hook Island to Stonehaven Bay where we found a whole field of empty mooring buoys inside the Reef Protection Zone. Emboldened by getting away with our lengthy stay a Pinnacle Point, we grabbed a mooring that was close to the beach and settled in for a two-day stay. 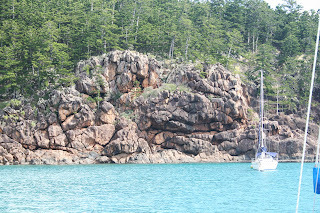 Alas, we couldn't prevent the day from arriving when we would have to take Mary to the airport and after 21 very fun days, we motored over to Hamilton Island where the airport was right on the edge of the bay. It was kind of scary to see what appeared to be huge 737s coming in for a landing just above the tops of the masts. No sooner had Mary left, we had the dinghy secured in it's davits and we departed for Townsville, about 150 miles to the north. The winds were forecast to be very light and I had set my expectations for motoring the entire way but a 15-knot southeasterly breeze filled in. With the genoa poled out to starboard, the main prevented off to port, we sailed all night into a beautiful setting moon. It was so magical that even the heavy freighter traffic didn't disturb my revery. The entrance to the Breakwater Marina in Townsville is very shallow and for the most part we only had 1 foot of water under the keel. Townsville is a bustling little beach-side community with lots of attractions for visitors. Unfortunately, it's beautiful beaches are currently closed to swimming as there are deadly box jellyfish in the water. After a few repairs, we'll be underway again although we'll time our departure to be at high tide!